Posted in cakes and tagged blue, bow, dots, fudge cake, gift box cake. Bookmark the permalink. This cake is chocolate chip with fudge filling and iced in chocolate chip buttercream. 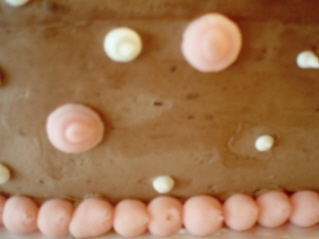 Posted in cakes and tagged cake, dots, pink. Bookmark the permalink.